Over the weekend at the Cheltenham Literature Festival, Steven Moffat held a Q&A on Sherlock and Doctor Who - but the most interesting thing he mentioned was that we've all missed something about The Doctor's Regenerations when it comes to the established 'only 12 times' rule. Whatever could he mean? Let's speculate! One of the most likely scenarios involves the most recent example of Regeneration we've had in the show. In 2011's Let's Kill Hitler the recently regenerated Human/Time Lord Melody Pond née River Song, having learned of The Eleventh Doctor's importance in her and her parent's future, chooses to save his life by bestowing her regeneration cycles to him, curing him of the poison she'd infected him with earlier (It's a long story.). If we take River's transference as literal, and paying credence to The Deadly Assassin's '12 regenerations' limit, she had already regenerated twice - once from the young Melody in New York to 'Mels', and then from Mels into River - leaving 10 regenerations to The Doctor. Easy peasy, problem solved... right? What if The Doctor's actually already used his Regenerations up? What if there were incarnations before William Hartnell? Thus implies The Brains of Morbius. In a scene in the fourth episode of this 1976 classic, The Fourth Doctor engages in a battle of mindbending with the villainous Morbius, pitting his own mind against the renegade Time Lord's in a battle to the death. During the contest, the machine used to facilitate the psychic battle flickers with images of with previous incarnations of The Doctor, including the Third, Second and First Doctors... but then Morbius digs even further into The Doctor's past, with eight more faces appearing on the screen before Morbius' brain case shorts out - implying that the 'Fourth' Doctor was actually the twelfth incarnation (interesting implications since the 12-body limit would first come up only 4 serials later!). Producer Phil Hinchcliffe has confirmed multiple times that the faces - actually members of the production staff dressed up - were meant to be past incarnations of The Doctor, however since then the show has retconned multiple times that William Hartnell's Doctor is the earliest incarnation (such as The Mawdryn Undead, The Five Doctors, The Eleventh Hour, The Lodger and The Name of The Doctor, to name a few). Theory now places these faces as previous incarnations of Morbius, but still the Moff could easily drag it up again to disprove the Limit. Right. Now we're getting into the crazy stuff! We already know for sure that there's a 'missing' Doctor from the Time War thanks to John Hurt popping up just in time for the end of The Name of The Doctor earlier this year. Although as Eleven states, his actions were 'Not in the name of 'The Doctor'', Hurt's Time Lord is still very much an incarnation of the Time Lord we know as 'The Doctor', whether he used that name or not. Which definitely makes our 'Eleventh' Doctor actually the twelfth incarnation of The Doctor's body. But how might he actually be the Thirteenth, the purported 'final' face? Step in Metacrisis Doctor! Mouths spent a week agape in July 2008 when a crippled Tenth Doctor, having been exterminated by a Dalek (who clearly hated mushy romance tropes), began to regenerate in front of Rose, Donna and Jack. But we all know what happened next - the convenient vessel of The Doctor's sliced off hand absorbed The Doctor's regenerative energy, healing him without forcing a new incarnation on him because of technobabble reasons ... erm, something. So the Doctor didn't 'really' regenerate as we would use the term, right? Maybe not. 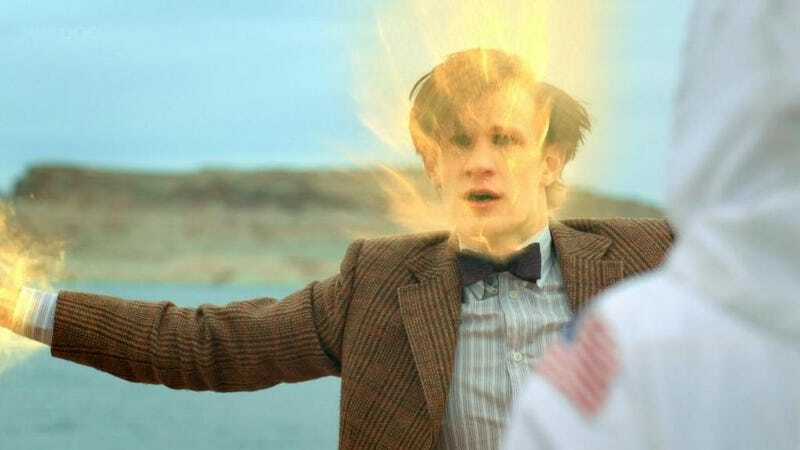 If we look at regeneration by definition, it is an involuntary biological process that heals a fatally wounded Time Lord, restoring them but also transforming their physical features and personality quirks in the process. Although he doesn't undergo the change of face, The Tenth Doctor is healed of a wound that would've otherwise killed him. If Regenerations are strictly limited, there must be a limit to the amount of regenerative energy a Time Lord can use - enough that they can change form 12 times. Undoubtedly, despite the lack of a body transformation, the Tenth Doctor used a great deal of regenerative energy to save his incarnation - energy that once used, cannot be returned, meaning that The Doctor is 'down' another regeneration. So if Matt Smith is actually the 13th and final 'body' of The Doctor, and we know Peter Capaldi is on the way at Christmas (unless his casting is an elaborate ruse to hide the fact that Doctor Who is ending for good in December - what a twist! ), The Doctor will have to supersede the Limit between now and the Christmas Special - maybe even during the events of The Day of The Doctor. The crazy train keeps going! Back in 2007's The Sound of Drums when The Master has a sneaky little telephone chit-chat with The Doctor, he tells him that the Time Lords, desperate for a edge against the Daleks during the Time War, resurrected the dead Master (who had used all of his regenerations - and then some - over the course of the classic series) and granted him a new cycle of Regenerations in order to fight as the 'Perfect Warrior'. What if The Doctor had fallen in battle, unable to regenerate and permanently 'dead', but was similarly raised again and given a new cycle, starting with John Hurt's Doctor? We all know, thanks to The Impossible Astronaut and many others that Time Lords can be permanently killed before they regenerate - and we can assume that this is something the Daleks would've been familiar with and actively practising during the Time War in order to best their enemies. So what if, presumably, the Eighth Doctor was killed in action before he could regenerate, but the Time Lords resurrected him, granting him a new face (John Hurt), and a new cycle of 12 regenerations? This one's very shaky, mainly because it could easily be dismissed in a months time during The Day of The Doctor. But for now, it remains a possibility, albeit a slim one. Now, this one's just very silly, but it's cropped up in various places over the past few days and I love it, so even though it's not very likely - nay, impossible - let's dive in anyway! Having collapsed at the end of 1966's The Tenth Planet, the weakened First Doctor transforms into a younger man - a process his new incarnation refers to in the following serial, The Power of The Daleks, as Renewal - implying not a regeneration, but the restoration of youth. Same man, just... younger. Fast forward a few years to The War Games, Patrick Troughton's swansong, when the Time Lords exile The Doctor to Earth as punishment for his meddling in Time, changing his appearance in the process. Although appearance changing is an aspect of Regeneration, it's never declared as such by the Time Lords; it's merely part of The Doctor's sentence and exile. He wasn't mortally wounded, nor in need of 'Renewal' into a younger body - he's simply transformed into the Third Doctor and deposited back on 20th Century Earth. It isn't until 1974's Planet of the Spiders that we actually hear about the process that is Regeneration specifically, and that The Third Doctor regenerates into the Fourth. So, on a technicality, The Doctor doesn't actually use a regeneration until that transition - the first Doctor 'renews' himself into a younger man, and the second is just altered by the Time Lords rather than actually forced into regeneration, making the upcoming regeneration only the 9th (or 10th, thanks to the Hurt Doctor) out of the limited 12. So The Doctor would still be good to regenerate at least twice more! This is of course, very silly - The First and Second Doctor's arrivals aren't called 'Regenerations' in their final stories merely because the production staff didn't coin the term for the process as such until Barry Lett's team did in the 70's. Since then, the show has established that that the First, Second and Third Doctors are all separate incarnations rather than the same body de-aged or transformed, and it's thus engraved in the public conciousness as such. Still, you can't beat a good bit of fannish over-theorising, right? So, there are plenty of ways Steven Moffat could go about solving the problem of the '12 regenerations' limit - some simple, some complicated, some just downright crazy. Or he could do something else entirely, as he's wont to do! But if one thing's for sure, his comments at Cheltenham seem to show that it's not something that he plans to sweep under the rug and carry on regardless as we head into the Peter Capaldi era. Perhaps we'll find out soon enough just how many lives The Doctor has left - barring accidents, of course.